Now with added MMA fighter mo-cap. Phantom 8 has released a new gameplay trailer for Past Cure, that action-stealth thriller about "the struggles of a man tormented by shiny muscular mannequins." The trailer focuses on combat mechanics, complete with commentary from Nick Mallinder, an animation artist at Phantom 8. 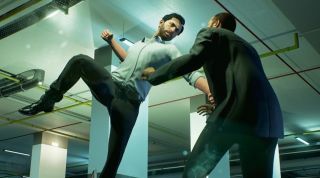 The video offers a glimpse of the "special skills Ian possesses as a consequence of the experiments he underwent", as well as the game’s melee and stealth systems. "Many levels can be approached in different ways with Ian‘s abilities, allowing for full on action or a more stealth-oriented approach," states the press release. "Players who wish to avoid direct battle can use astral projection to scout the area and create distractions for patrolling enemies by disabling security cameras. " Yeah, you read that right: astral projection. Think of it like Assassin's Creed's Eagle Vision. The time manipulation skill, on the other hand, "helps the player to evade enemies, execute stealth kills, or pull off the perfect head shot during combat." Your use of weapons can be supported, or replaced, by melee combat, and stealth kills use the motion-capture of specialist MMA fighters. The developer also dropped details of a little pre-order bonus, but while soundtracks have been confirmed for hard copy pre-orders, as yet, the team hasn't detailed what's available for upfront digital orders. We'll keep you posted. Past Cure will be out on February 2, 2018.